in his self-immolation protest on November 8, 2012. China has ruled out allowing foreign observers into Tibetan areas amid continuing self-immolation protests, with officials on Friday blaming “exiled separatist forces” for the recent unrest. 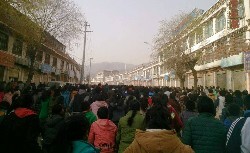 On Friday, hundreds of Tibetan students protested in the monastery town of Rebkong (Tongren in Chinese) in north-western Qinghai province. This followed self-immolation protests by an 18-year-old Tibetan, Kalsang Jinpa and a 23-year-old mother, Tamding Tso, in the town earlier this week. At least six Tibetans have set themselves on fire over the past week, with three teenage monks on Wednesday carrying out protests in the Ngoshul Monastery in Aba, a county in south-western Sichuan that has witnessed most of the at least 68 self-immolations seen in Tibetan areas. Overseas groups said a Tibetan man had also carried out a protest in the Tibet Autonomous Region (TAR) earlier this week. The immolations have brought a tight security clampdown across Tibetan areas, not only in the TAR but also in the provinces of Sichuan, Qinghai and Gansu. The monastery town of Rebkong, where two self-immolations were reported this week before Friday’s protests by students, has been under heavy security since March, when a monk and a farmer set themselves on fire. Overseas groups said 5,000 students gathered in front of the famous 14th century Rongwo monastery on Friday morning. Photographs showed large crowds of Tibetans around the golden statue of Dolma, which sits on a square located at the monastery’s entrance. Monks in Rebkong told The Hindu in interviews during a visit in April that the tight security presence had led to tensions. Back then, a permanent SWAT van was stationed outside the monastery near the square, with patrols of armed police walking through the town’s narrow streets among monks and students. Officials from the TAR government held a meeting in Beijing on Friday along the sidelines of the Communist Party’s 18th National Congress, which opened on Thursday. Officials from every province or region meet during the congress to review the past decade and announce new policy measures. Qiangba Puncog, the head of the TAR government’s People’s Congress, added that the protests were “concentrated around six to seven monasteries out of more than 10,000 in the region”. He ruled out allowing foreign observers into Tibetan areas, as suggested recently by the United Nations High Commissioner for Human Rights Navi Pillay. Editor's NOTE-- Ananth Krishnan is Beijing based correspondent for the Indian Newspaper- The Hindu, and the above article is originally published on The Hindu. The paper has been highly pro China for last many years, however in recent times with the change of Editor, the paper is being more or less unbiased and remaining to the ethics of journalism.